Hello everyone! Our Prime Minister Shri narendra modi delivered inspiring and impressive speech on Saturday 27th September 2014 at United Nations. We the people of India are proud of him. I am proud to be an Indian and being a part of such a wonderful country. Let’s discuss about some magical and inspirational sentences of narendra modi ji. Narendra modi ji reminded whole world about our country’s enduring battle against terrorist groups and also talked about the countries that give us shelter before capping his speech with a call for an international yoga day. Isn’t it amazing guys? Well, during his maiden speech to the United Nations general assembly he hinted at India’s longstanding disputation that its competitor, Pakistan, backs groups that have carried out the terrorist attacks in India. In addition, he stated that we are prepared to connect in a serious two-sided dialogue with it “Without the shadow of terrorism”. He also added that “Pakistan must also take its responsibility seriously to generate an appropriate environment for that”. His 35 minutes speech covered several important topics including terrorism, its reappearance in west Asia, improvement of the United Nations, including the Security Council, and the requirement for more comprehensive global development. Moreover, he said that India desired a peaceful and stable environment for its development. He said “Nation’s destiny is linked to its neighborhood. That is why my government has placed the highest priority on advancing friendship and co-operation with the neighbours. He told to Pakistan that instead of raising problems at the United Nations (UN), “Today we should be thinking about the victims of floods in Jammu and Kashmir. In India, we have organized massive flood relief operations and also have offered assistance for Pakistan-occupied Kashmir”. He added “India is a part of developing world; however we are prepared to share our modest resources with those countries that require this assistance as much as we do”. What a wonderful speech! Everyone loved the speech at United Nation and everyone is talking about narendra modi’s speech at UN. It was just fantastic! Let me first congratulate you on your election as the President of the 69th session of United Nations General Assembly. It is a truly a great honour to address you for the first time as the Prime Minister of India. I stand here conscious of the hopes and expectations of the people of India. I am also mindful of the expectations of the world from 1.25 billion people. India is a country that constitutes one-sixth of humanity; a nation experiencing economic and social transformation on a scale rarely seen in history. Every nation`s world view is shaped by its civilization and philosophical tradition. India`s ancient wisdom sees the world as one family. It is reflected in a tradition of openness and diversity; co-existence and cooperation. This is why India speaks not just for itself, but also for the cause of justice, dignity, opportunity and prosperity around the world. It is also because of this timeless current of thought that India has an unwavering belief in multilateralism. Today, as I stand here, I am equally aware of the hopes that are pinned on this great assembly. I am struck by the sacred belief that brought us together. An extraordinary vision and a clear recognition of our shared destiny brought us together to build this institution for advancing peace and security, the rights of every human being and economic development for all. From 51 nations then, today 193 sovereign flags fly at this building. Each nation, born into freedom, has sought a place here with the same belief and hope. We have achieved much in the past six decades in our mission in ending wars, preventing conflict, maintaining peace, feeding the hungry, striving to save our planet and creating opportunities for children. 69 UN peacekeeping missions since 1948 have made the blue helmet the colour of peace. Today, there is a surge to democracy across the world; including in South Asia; in Afghanistan, we are at a historic moment of democratic transition and affirmation of unity. Afghans are showing that their desire for a peaceful and democratic future will prevail over violence. Nepal has moved from violence to peace and democracy; Bhutan`s young democracy is flourishing. Democracy is trying to find a voice in West Asia and North Africa; Tunisia`s success makes us believe that it is possible. There is a new stirring for stability, progress and progress in Africa. There is unprecedented spread of prosperity in Asia and beyond, rising on the strength of peace and stability. Latin America, a continent of enormous potential, is coming together in shared pursuit of stability and prosperity, which could make it an important anchor of the world. India desires a peaceful and stable environment for its development. A nation`s destiny is linked to its neighbourhood. That is why my Government has placed the highest priority on advancing friendship and cooperation with her neighbours. This includes Pakistan. I am prepared to engage in a serious bilateral dialogue with Pakistan in a peaceful atmosphere, without the shadow of terrorism, to promote our friendship and cooperation. However, Pakistan must also take its responsibility seriously to create an appropriate environment for it. Raising issues in this forum will derail the efforts to resolve the issues between our two countries. Instead, today, we should be thinking about the victims of floods in Jammu and Kashmir. In India, we have organized massive flood relief operations and have also offered assistance for Pakistan Occupied Kashmir. India is part of the developing world, but we are prepared to share our modest resources with those countries that need this assistance as much as we do. This is a time of great flux and change. The world is witnessing tensions and turmoil on a scale rarely seen in recent history. There are no major wars, but tensions and conflicts abound; and, there is absence of real peace and uncertainty about the future. An integrating Asia Pacific region is still concerned about maritime security that is fundamental to its future. Europe faces risk of new division. In West Asia, extremism and fault lines are growing. Our own region continues to face the destabilizing threat of terrorism. Africa faces the twin threat of rising terrorism and a health crisis. Terrorism is taking new shape and new name. No country, big or small, in the north or the south, east or west, is free from its threat. Are we really making concerted international efforts to fight these forces, or are we still hobbled by our politics, our divisions, our discrimination between countries, distinction between good and bad terrorists? Even today, states allow terrorist sanctuaries on their territory or use terrorism as instruments of their policy. We welcome efforts to combat terrorism`s resurgence in West Asia, which is affecting countries near and far. The effort should involve the support of all countries in the region. Today, even as seas, space and cyber space have become new instruments of prosperity, they could also become a new theatre of conflicts. Today, more than ever, the need for international compact, which is the foundation of the United Nations, is stronger than before. While we speak of an interdependent world, have we become more united as nations? Today, we still operate in various Gs with different numbers. India, too, is involved in several. But, how much are we able to work together as G1 or G-All. On the one side, we say that our destinies are inter-linked, on the other hand we still think in terms of zero sum game. If the other benefits, I stand to lose. It is easy to be cynical and say nothing will change; but if we do that, we run the risk of shirking our responsibilities and we put our collective future in danger. Let us bring ourselves in tune with the call of our times. First, let us work for genuine peace. No one country or group of countries can determine the course of this world. There has to be a genuine international partnership. This is not just a moral position, but a practical reality. We need a genuine dialogue and engagement between countries. I say this from the conviction of the philosophical tradition that I come from. Our efforts must begin here – in the United Nations. We must reform the United Nations, including the Security Council, and make it more democratic and participative. Institutions that reflect the imperatives of 20th century won`t be effective in the 21st. It would face the risk of irrelevance; and we will face the risk of continuing turbulence with no one capable of addressing it. We should put aside our differences and mount a concerted international effort to combat terrorism and extremism. As a symbol of this effort, I urge you to adopt the Comprehensive Convention on International Terrorism. We should ensure that there will be peace, stability and order in the outer space and cyber space. We should work together to ensure that all countries observe international rules and norms. Let us continue redouble our efforts to pursue universal global disarmament and non-proliferation. Second, we must pursue a more stable and inclusive global development Globalisation has created new poles of growth; new industries; and new source of employment. At the same time, billions live on the edge of poverty and want; countries that are barely able to survive a global economic storm. There has never been a time when it has seemed more possible than now to change this. Technology has made things possible; the cost of providing it has reduced. We no longer are totally dependent on bricks and mortars. If you think of the speed with which Facebook or Twitter has spread around the world, if you think of the speed with which cell phones have spread, then you must also believe that development and empowerment can spread with the same speed. Each country must of course take its own national measures; each government must fulfil its responsibility to support growth and development. At the same time, we also require a genuine international partnership. At one level, it means a better coordination of policy so that our efforts becomes mutually supportive, not mutually damaging. It also means that when we craft agreements on international trade, we accommodate each other`s concerns and interests. When we think of the scale of want in the world – 2.5 billion people without access to basic sanitation; 1.3 billion people without access to electricity; or 1.1 billion people without access to drinking water, we need a more comprehensive and concerted direct international action. In India, the most important aspects of my development agenda are precisely to focus on these issues and address them in a definite time frame. The eradication of poverty must remain at the core of the Post-2015 Development Agenda and command our fullest attention. Third, we must seek a more habitable and sustainable world There are debates and documents on these issues. But, we see many things around us that should cause us alarm. And, also many things that we no longer see – forests, birds and animals, clean rivers and lakes and blue skies. I want to say three things. One, we should be honest in shouldering our responsibilities in meeting the challenges. The world had agreed on a beautiful balance of collective action – common but differentiated responsibilities. That should form the basis of continued action. This also means that the developed countries must fulfill their commitments for funding and technology transfer. Second, national action is imperative. Technology has made many things possible. We need imagination and commitment. India is prepared to share its technology and capabilities, just as we have announced a free satellite for the SAARC countries. Third, we need to change our lifestyles. Energy not consumed is the cleanest energy. We can achieve the same level of development, prosperity and well being without necessarily going down the path of reckless consumption. It doesn`t mean that economies will suffer; it will mean that our economies will take on a different character. For us in India, respect for nature is an integral part of spiritualism. We treat nature`s bounties as sacred. Yoga is an invaluable gift of our ancient tradition. Yoga embodies unity of mind and body; thought and action; restraint and fulfillment; harmony between man and nature; a holistic approach to health and well being. It is not about exercise but to discover the sense of oneness with yourself, the world and the nature. By changing our lifestyle and creating consciousness, it can help us deal with climate change. Let us work towards adopting an International Yoga Day. Every age is defined by its character; and, each generation is remembered for how it rose together to meet its challenges. We have that responsibility to rise to our challenges now. Nowhere is this more pronounced than in this great assembly. Next year we will be seventy. We should ask ourselves whether we should wait until we are 80 or 100. Let us fulfill our promise to reform the United Nations Security Council. Let us fulfill our pledge on a Post-2015 Development Agenda so that there is new hope and belief in us around the world. Let us make 2015 also a new watershed for a sustainable world. Let it be the beginning of a new journey together. 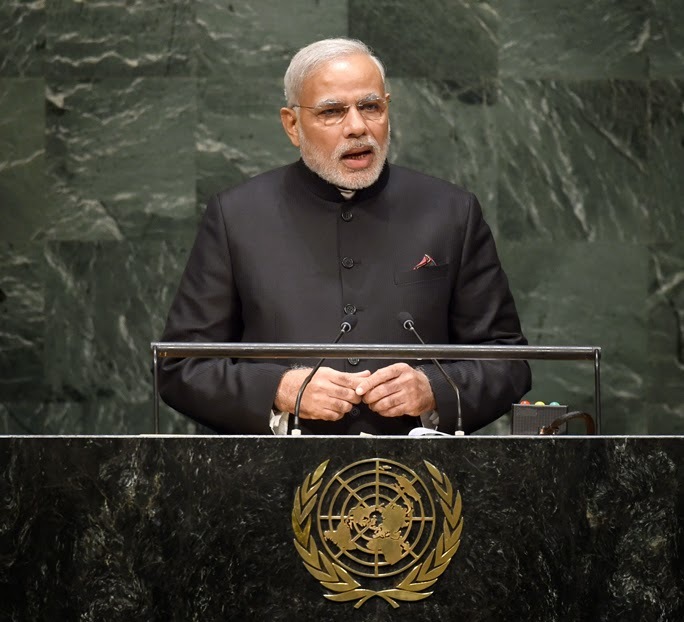 Click here To read the Prime minister Narendra Modi's Speech at United Nations General Assembly in hindi.